Turkey: No tweets from the courtroom! 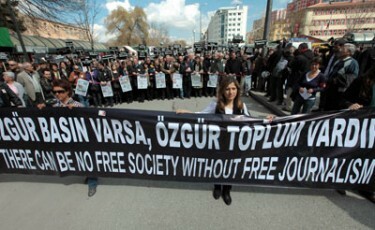 In Istanbul-Turkey, today is the 2nd day of the hearings of 10 arrested journalists. Turkey is the leader country even before China and Iran with the figures of 107 arrested journalists. Since the national mainstream media is not covering the news properly, colleagues of the detained journalists have no other choice but to tweet from the courtroom. According to Turkish law, the hearings are open unless a court order forbids it. But since yesterday, the judge has been constantly warning, then threatening those who try to give news from the courtroom. Today he said that those tweeting will be subjected to legal procedure. Neither the journalists nor the lawyers tweeting from the courtroom didn't really understand what the “procedure” will be. Alas, they tweet anyway. The political arrests have become the legal (and lethal) weapon of the Turkish government to silence dissents and journalists. According to AFP figures 1/3 of the terrorists in the world are in Turkey. It is necessary to remind that the 500 detained students, 107 journalist and thousands of Kurdish politicians are considered to be “terrorists” in these political cases. Ironically, yesterday Interior Minister of Turkey said “Terrorism is not only on the mountains but in poetry, in paintings, in the universities, in NGO's. We will monitor those as well“. To Keep updated, please follow @oemoral, @petite1ze, @etemelkuran for live tweeting from the court. I feel myself lucky for having journalists like you and your friends in my country. I wish freedom to all arrested journalists. I think the matter is not ban on tweet from the court. Turkey has many problems without tweeting. But for especially these courts, mass media and “alternative”(?) journalists don’t matter anything except some famous journalists. Please read my comments on arrested journalists.